Delhi is getting hotter by the day, so if you’re looking to enjoy the outdoors on that occasional pleasant evening, these rooftop restaurants in Gurgaon are meant for you. As an added respite, they all come equipped with mist fans or coolers, so that you don’t end up melting into a puddle. Head over to Terrace for cocktails and canapés desi style. Although we’d recommend going on a cold night to enjoy their delicious kebabs right off the charcoal, their rooftop views aint too bad August onwards. If there’s one thing you should do outdoors this season, it’s grabbing a table on this deck, barely inches above the shimmering expanse of a mashaal-lit blue pool. As an added bonus, the food’s pretty great too. Gravel under your feet, a bunch of trees between brick tables and benches, and a wooden fence make for a bucolic setting. A pleasant outdoor space, with ample room for a large lunch group, makes Roots our favourite spot on this list. The outdoor section of this Gurgaon microbreweries features a faux-graffiti wall, which we guess is an ode to the beer motherland—Germany. With unique cocktails, delicious snacks and one hell of a view, Vibe–The Sky Bar is a great post-work or evening hangout spot. Situated on the 10th floor of The Hilton, Vibe has a stunning space, with lots of artificial grass and smooth wood-panelled floors to complete the decor. Don’t forget to pair all of that with their fun Bubblegum cocktail. Though the indoor space is a nice space to relax in itself, Downtown has a rather cosy rooftop with a microbrewery as well. With white umbrellas, high chairs and round tables accompanied by a view overlooking the market, there aren’t many ways you could go wrong with this one. The outdoor is section is absolutely gorgeous with picnic benches and all-green surroundings (bring your date here). Try their pizzas and the soya garlic chaap and your taste buds will thank you. Since Cyber Hub opened its doors, Gurgaon has never been the same. We love it for its slew of restaurants spilling out on to the main boulevard (the sprawling terraces for a few of them are amazing). Take your pick from SodaBottleOpenerwala, Wine Company, Pier 38, Beer Cafe, Sutra, Raasta, Soi 7 and Imperfecto. 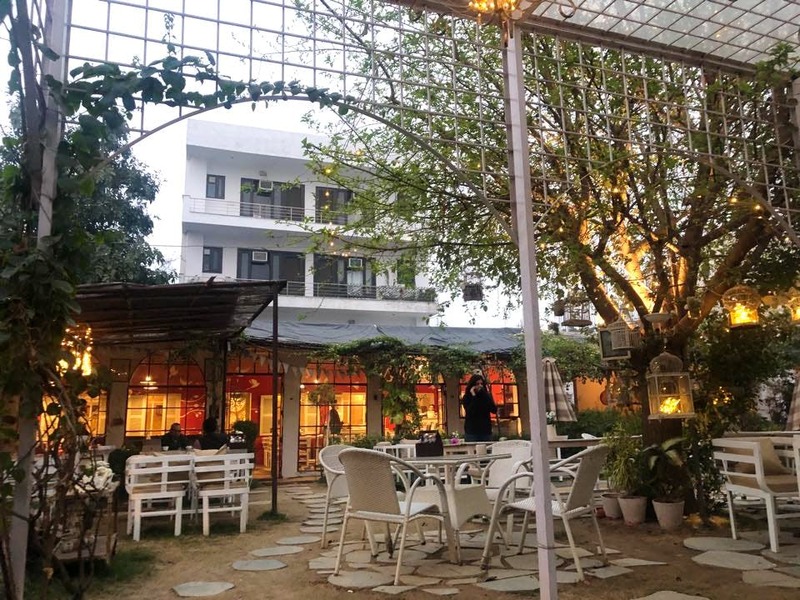 Soul Garden in Gurgaon is a beautiful garden that’s a co-working space, a brekkie spot and an organic haven. While we love the outdoor space, we’re happy to report that the peppy red and white interiors are equally welcoming. Plus, they've got board games and books to keep you company. They’re also one of the best brekkie places in Gurugram that open at 9am. AMPM is one of our favourite places for cocktails in G-Town. From the fiery Tabasco laced Spicy Senorita to the fragrant Hakim's Stinger, each drink has a unique identity. Also, make it a point to reach early if you want a table outdoors. They've got live music too (on most days) which is again an added bonus.